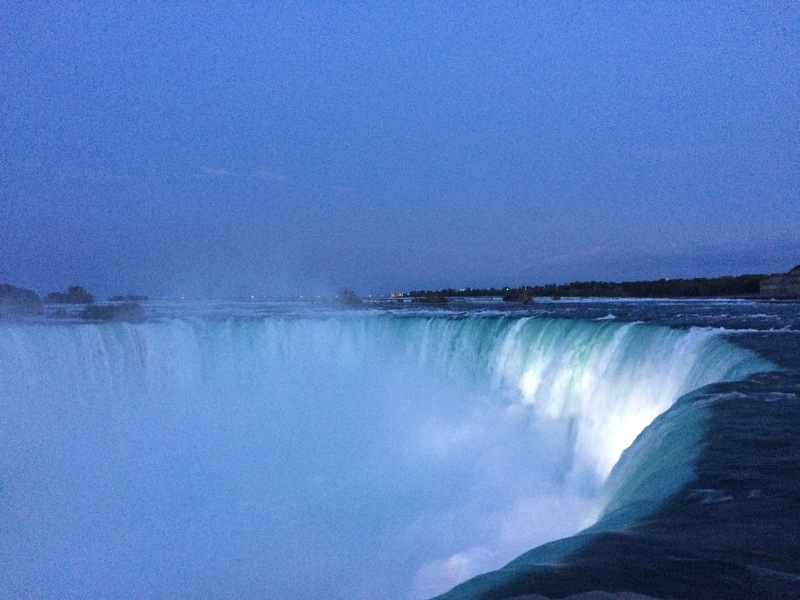 Having visited Canada and the motel room I was held in, early in my visit here, I have felt free to explore Niagara Falls. I could be a tour guide now. I’ve run alone early in the morning when no one was on the road or at the falls. I’ve spent a lot of time upriver, down river, at the falls, continually feeling the past washing through and out behind me. Keeping this visual alive has given me the momentum I needed to fully feel and clear out any of the dark, heavy parts that have come up here. Nature, and especially the enormous power of the falls, has been integral in bringing me into the present. This place is now beautiful and sacred to me. I will come back and bring my family to share in its beauty also. On Day 3 of MFR II, John invites me onstage for a sphenoid release. I feel safe. It’s safe to let go. Energy begins to surge through me and I start to quietly cry. The wave goes through and I spontaneously breathe in, filling the space with air. I feel many surges go through me and my body softly moves. The energy becomes more intense and my back arches – my entire body hits a still point and I feel my muscles contracting, compressing me tighter into this position. I soften – another wave and a similar position. I feel my arms floating. They are coming up to my chest towards my throat. “Let the sound out,” John says. My body holds its breath. It is not allowing it. He softens and I soften out of the tightening. John has everyone go back to their tables so he can talk them through the technique and continues to work with me. He soothes me with his words, then asks me to feel my pelvis. I can’t feel it. Where is it? He asks me to do the frog position. I bend my knees and self-consciously wiggle my feet together. I hesitate. My diaphragm tightens. “Open your legs,” he says. A wave of embarrassment blankets me and I start to cry. This is exactly what my captor said to me the first time he raped me. “Remember it’s me here,” he says. It feels safe to move my legs and feel. Deep shame; ugliness, my legs feel weak and vulnerable. I can feel my pelvis now past my legs – it’s too much. I stay in my inner thighs and soften my upper body from there. John says, “you have nothing to be ashamed of. This guy did what he did because he was a creep.” I laugh at that and this loosens my hold even more. John says many encouraging things to me, keeping me feeling, in the present. He draws out more positive words from somewhere inside me. “You are beautiful. Let it feel good. Let yourself feel pure … innocent again.” These are the words that stay with me. This is the last technique of the day and we have the afternoon off. I feel completely vulnerable. “Like an egg yolk laying quivering on the sidewalk,” as I’ve heard someone say. My roommate Judy is so understanding. She says she’ll stay or go – whatever I need. She reads my body language and says she’ll go out for a walk so I can have time alone, but to text her whenever I need company. Thank you Judy! I can’t stay with the feelings anymore and I curl up on my side. The tears come. I feel safe. I fall into a deep sleep for an hour. When I wake up I feel an urgent need to get out of the hotel room. I put on my ball cap and sunglasses – incognito – and go out. I walk in a direction I haven’t been yet. There was a hidden path I had found that morning on my run beyond Terrapin Point. I feel where that is and walk that way. 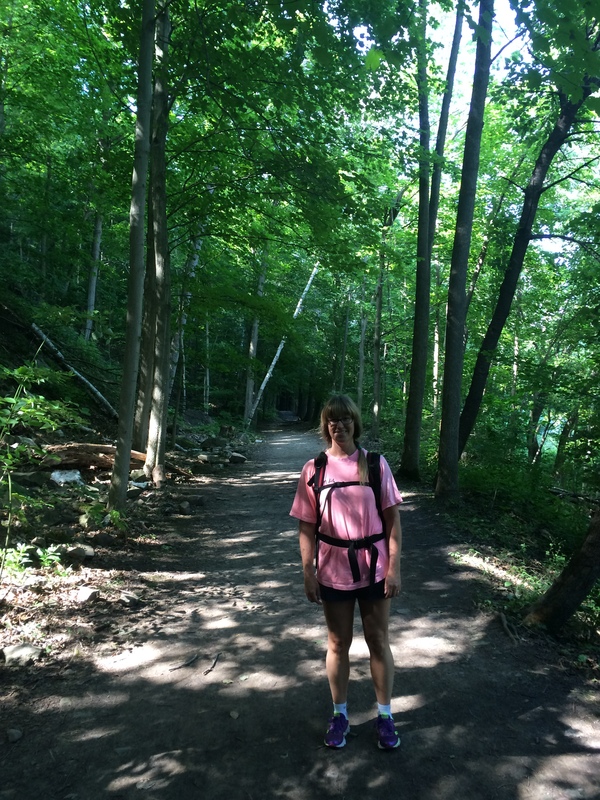 Judy texts me and we meet up and walk, by footbridge, to the farthest islands at Niagara Falls. I continue to let the rushing water wash away the past. I tell Judy the most shameful things I have been feeling – things I had only started to write about privately during my Therapy for the Therapist in Malvern a year and a half ago. Gradually, over the course of our walk on the hidden path, the words come out. The only time I feel pleasure is when I’m by myself and picturing myself being raped and sodomized. The visuals have gotten more vivid and demeaning and now I’m visualizing them being done to me in my office. I feel defeated. I feel like I’ve done no work at all. I know this crossing of wires can happen. I am realizing my body responded sexually at the time. I know it’s not my fault. I still feel ashamed. The next day in class, I suddenly realize I’ve locked my keys in my trunk. I say to John “well, I guess I’m not going home.” He says, “that’s pretty symbolic.” I’m not locked in the trunk . . . my keys are. The front desk calls a cab company. A foreign guy with very limited English says “come with me.” I’m a little nervous – so is the concierge, but he doesn’t follow. He asks where my car is. I point to the parking lot. He walks me to the passenger side of his minivan and says “get in the car”. Jolt of terror. He waits beside me. I let the feeling go through me and realize he needs me to direct him to the car. As I shut the door, I am ready to bolt if this goes sideways. I point out my car and we go over. He breaks in, the alarm goes off. I scramble into the back seat, pull down the seat into the trunk and drag out my backpack, grab the keys and unlock the car. Afterwards, I am shaking as I work in the seminar room. Just the jolt I needed to break me open. Nothing bad happened. Even though “get in the car”, was the exact phrase my captor yelled at me (with a knife in his hand and walking quickly toward me), I’m still here and I got what I needed – my keys. I feel the significance of the difference and how an innocuous situation can be quickly misinterpreted – if I hadn’t let the fear go through me and brought my power back in, how would I have responded? How would this man have felt – acted? I get in my car and drive over the Rainbow Bridge to Canada. The falls look open and beautiful – not closed and dark like they did when I drove over 11 days ago. I smile at the opening. As I’m driving past the street where the motel is, I ask myself if I need to go by it again. There is no one there anymore. There is no need. I see only the beauty in this place and want to bring my family here to enjoy it with me. I feel the road – so familiar a feeling. I realize I am in the driver’s seat. I’m not in the passenger seat with my eyes closed – terrified. I smile and tears of self-assurance bubble up. I breathe in and feel taller. All the way home I feel free and relaxed. I’m free. 3 months ago, I received an email from John Barnes Myofascial Release offices asking if I would instruct (help John) at the vacation series in Niagara Falls, New York. There was a moment of fear and apprehension. This is where I had been taken when I was abducted in 1988. I had been back once in 2005 after my first intensive treatment of MFR in Sedona, Arizona. I had let go a lot, but I clearly wasn’t done. 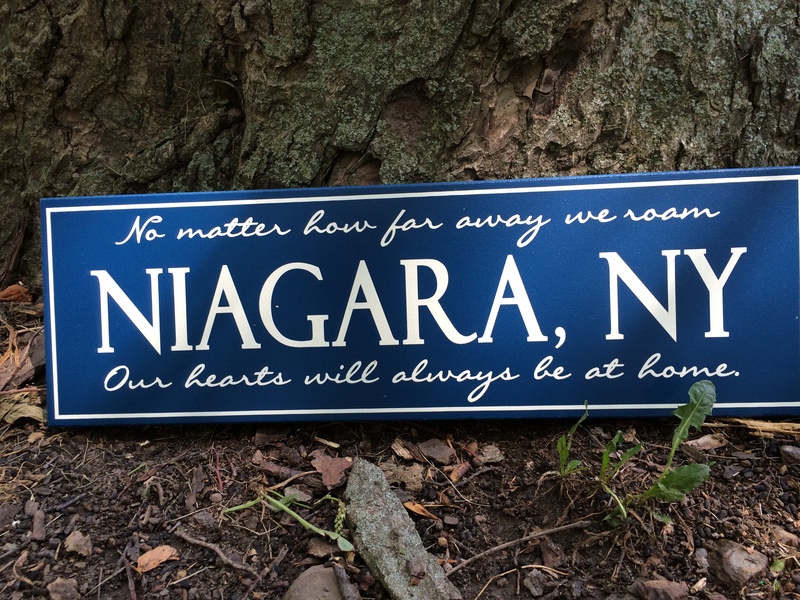 The mention of Niagara Falls brought up surges of fear. I was afraid to take my family there because I didn’t know what my body would do or if I would enjoy the experience with them. I wanted them to enjoy the falls, but that wasn’t going to happen with me there in this state. I talked it over with my husband John and we agreed this would be a perfect time to clear the past – in a safe space with the best support and an opportunity to transform it into better place for me. 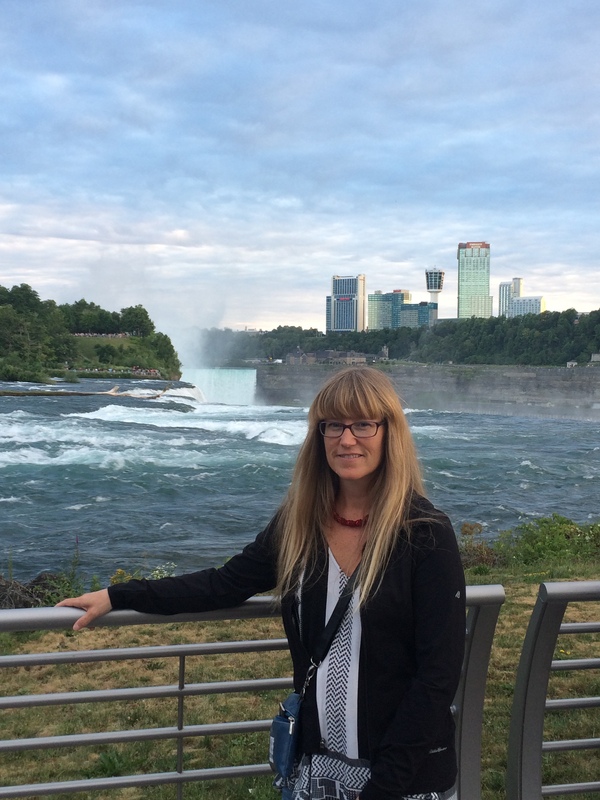 Since arriving in Niagara Falls, New York, my room mate Ann and I have seen the falls during the day and at night (including the fireworks), hiked Devil’s Hole gorge, and gone Whirlpool Jet boating in the rapids … all on our time off from instructing at MFR I. I feel I’m transforming my previous traumatic experience of being held captive here into a present with good feelings and memories. 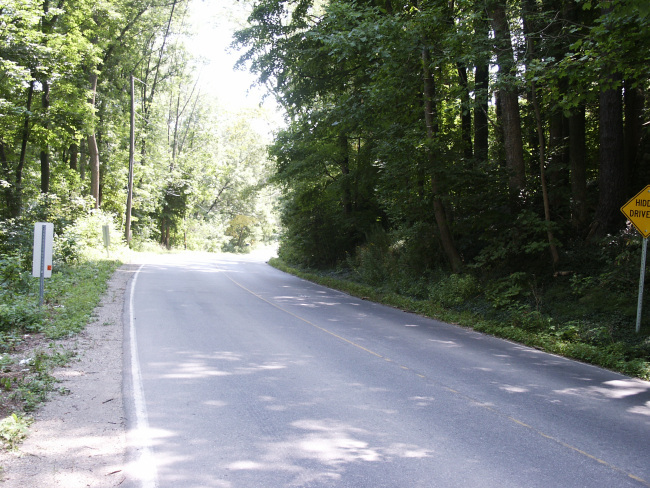 I admit, driving here was a series of shocks – the feeling and sound of the road, seeing the Skylon tower, driving past the motel I was held at. Everything a bit muted and surreal. Yet each day is a bit clearer. A huge improvement over my first visit here back in 2005 after my first intensive. What a difference 10 years of JFBMFR has made. This is my time of integration. That means applying the results of my MFR treatments into my life in and outside this tribe. My next goal is to bring my husband and daughters here with me and have it feel good and in the present. And even though, right at this moment, I feel like I’m going to puke and I’m getting the sweats, I don’t feel it’s too much. Thank you Ann for keeping things light, easy and fun. It has made all the difference. Thank you John. I got here because you never stopped nudging me. 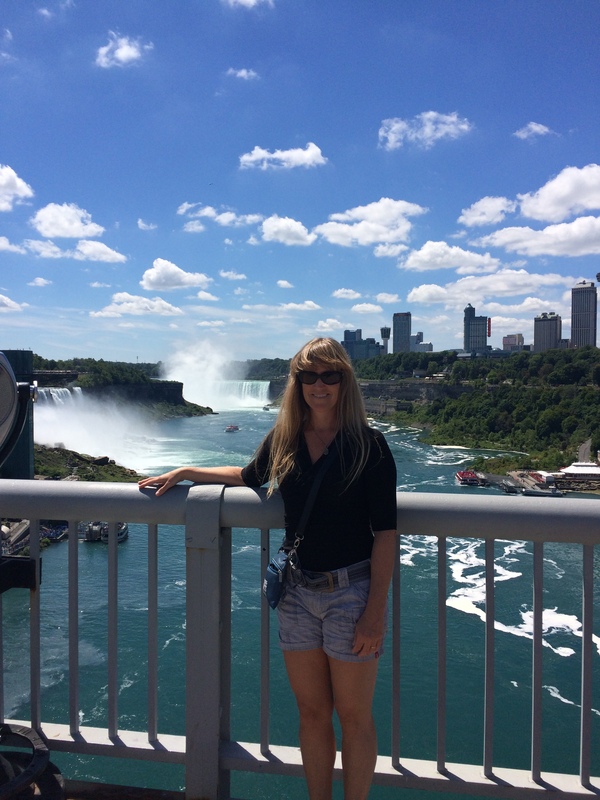 On Sunday, Ann and I took the pedestrian border crossing over to Niagara Falls, Canada. We sat at an outdoor patio, eating lunch and enjoying live music. 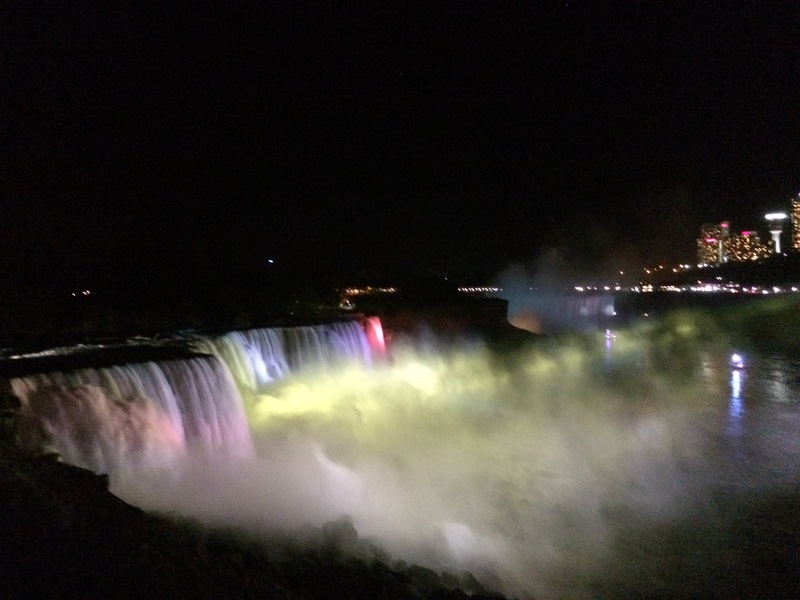 I soak up the good feeling – a new memory of the Falls is being created. I am so happy, it warms my stomach and I grin. After lunch we wander through the gardens and down to the waterfront. We reach the head of the falls, mist floating down on us, cooling us off in the hot sun. Leaning on the barrier, looking out across the falls, the roar of the moving water draws me in. My focus takes in the entire horseshoe and as I watch the water pour over the edge, I see my past disappearing. The closer falls feel like the recent past . At the far end, out across the expanse of water below, the feeling of the distant falls is of ancient memories falling away into nothing. Moment by moment, the present is letting go into the past, falling off into the mist. The motion reminds me that nature is constantly and rapidly changing – do we feel that? The feel of the past leaving is now embedded in me, and we wander away from the falls. Ann says to me that she will go wherever I need to go. 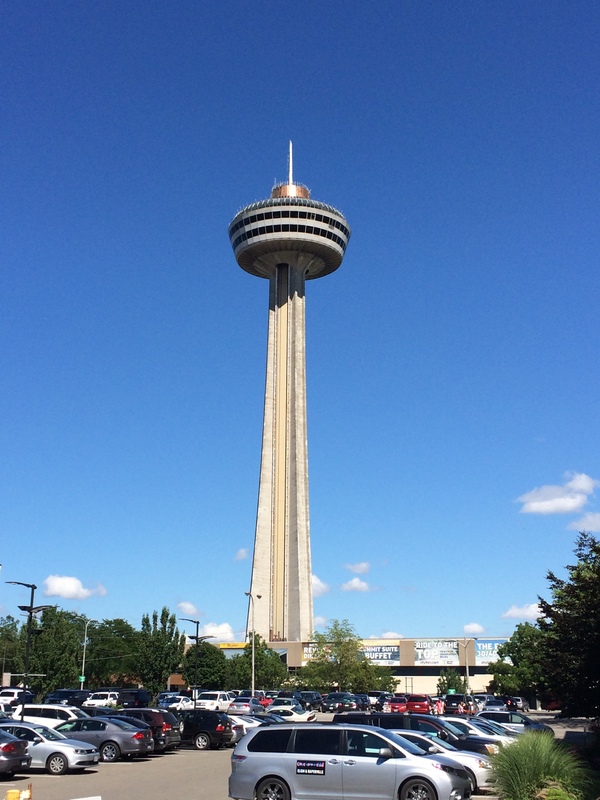 We walk uphill and behind the Skylon. We walk into an older part of the city – Lundy Lane. I follow the street names and we head up Ferry St.
As we are talking, I get a glimpse of the motel where I was held. My stomach drops, I stop briefly with my hands on my knees. I can do this. We continue on and I point out the empty property beside the motel which used to be a restaurant. Driving into town that day in 1988, as the car slowed, I had opened my eyes briefly, despite the yelling of my captor to keep my eyes closed and noted the restaurant sign. It’s how the police found the room later. I walk along the parking lot and view the office that we stopped at so he could get a room. I had continually thought about running naked, blindfolded and handcuffed from the room to the office for help, but it seemed too risky – I didn’t think I could move fast enough before he caught me. Ann and I walk down the row and I come to the room I was in and stand outside. I briefly try to picture myself in the room – it seems hard work and I sense that the 19 year old me is no longer in there anyway. That’s all I needed to know. I turn around and see the Skylon tower tall and innocuous. Not the shock it was three days ago when I drove by it. We walk away and as we leave and walk down the side walk, I feel a drag in my walking. It feels like a magnet pulling me back. I break down crying and cover my face. I’m not afraid. I’m not even sad that the past is behind me. I am crying because I don’t know that I want to feel my power coming back into me – I’ve felt weak for so long. I feel stuck in the middle – I’m no longer a victim, but I don’t want to embrace my power either. As we walk, the drag lets go and I feel spit out of the past into the present. Later, in the hotel room on the States side, I curl up in bed and let the tears come. I barely sleep, even though I am exhausted. The next day in class – day one of unwinding, John asks us to look at one belief we have about ourselves that is no longer serving us and to ask ourselves what would be a more positive, helpful way to act and be now. I immediately think – I believe that people feel sorry for me. I hate this. I hate people worrying about me. The alternative is that if I embody my powerful self, that people will no longer feel sorry for me. Great – but I don’t want to be powerful – I don’t want to diminish those around me. I want them to shine. I’m stuck in neutral. I don’t get too engaged in the belief and how I’m going to change it. I focus on feeling my way through the day. I feel guilty for feeling powerful. I go up on stage for the 3 person unwinding. John and Donna facilitate my unwinding. I stay in my body as much as I can. I let go as much as I can. John says to me “run out of the room”. I feel sooo heavy, but I pull myself up and slowly get to the edge of the table. I stop. I feel nauseous and cough that up. It lightens me enough I get off the stage and run faster and faster to the back door and push out into the hall. I run to a corner and crouch in it – automatic response. I get up and walk around and around — then I walk further than my belief. I walk outside the range of pity. I feel power trickling into me and I cry at the discomfort. I make my way back in and Judy is there. I sit beside her and the waves of sadness come again and again. I feel myself bracing against letting the energy come into my upper body. I stifle the sound. After class, several people come up to me say that what I had said and done today helped them. I’m stunned. It’s what I wanted – to help others. I’m really not healing from the past anymore. I am trying to sort out how to have a new present and still help others. This blog is part I of a series coming out now . . .